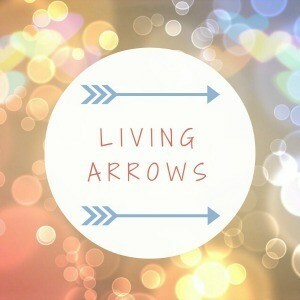 I feel as though I’ve only just hit publish on last weeks Living Arrows post, and here I am again writing another one. We definitely had a bit more of a chilled out week than previous weeks, which I think we needed. So read on to find out what we did actually get up to in this weeks Living Arrows post! Mondays and Wednesdays are always pretty chilled out days here as Isla has nursery in the afternoon, so we try not to do anything too strenuous in the morning so she’s not a nightmare while there. Plus, by the time she has woken up, and I’ve managed to get her dressed and she’s finished breakfast (which can sometimes take nearly an hour these days!!) it’s nearly time to give her lunch before I have to take her to nursery! On Tuesday I took Isla to get weighed, and she is now 8.36kgs, which is 18lb 6oz, which is smack bang between the 25th and 50th centile, which is a lower centile that she has been in a long time, but that’s because she never stops moving!! Thursday we went for a wander round town, mostly because I had got myself a new phone, and so needed a new SIM card for it, and changed my contract at the same time. Isla loved going round town, as she could watch so many people and see lots of new things. Although she did get a bit tired towards the end, and fell asleep almost as soon as we got in the car to head home. The poor mite however had woken up on Thursday morning with a bit of conjunctivitis, and it has steadily got worse over the days since. Now when she wakes up she can’t really open her eyes as they as so full of…gunk, for a better word! This then upsets her, but she gets even more upset when we try to clean them out. And don’t even get me started on when we have to put antibiotic drops in her eyes which the doctor gave her. Anyone would think we were trying to kill her with how much she screams. I’m not sure how well the drops are working, as I think it’s getting worse, but we have only been using them for a couple of days, so will see how we go. Friday we had our first BBQ of the year, with some friends from the village and their children. It was lovely, and the weather was so nice. It very much seemed like a hint of things to come for the Summer, with the two girls playing so nicely together. Hopefully by the time Summer is in full swing Isla will be walking, and they can play together while us adults eat, drink and be merry. Over the weekend we went to Kew Gardens, as we had a 2 for 1 voucher that expires next week, so thought we should use it. 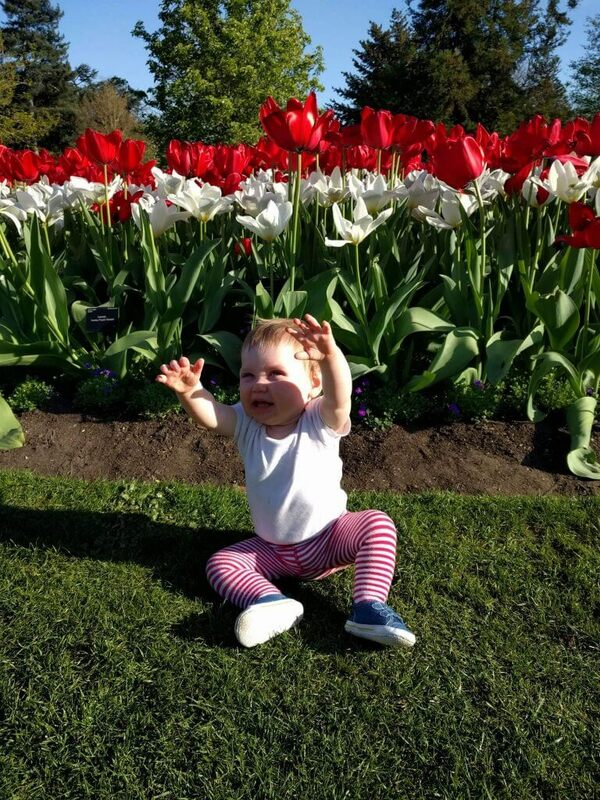 Isla seemed to love looking at all the different plants and flowers there, with their bright colours. She took ages to fall asleep though, as I think there was too much going on for her, but she eventually slept for a bit. Right at the end, we saw this beautiful bed of tulips by the Elizabeth gate. I love tulips, and ours at home are just starting to come out. 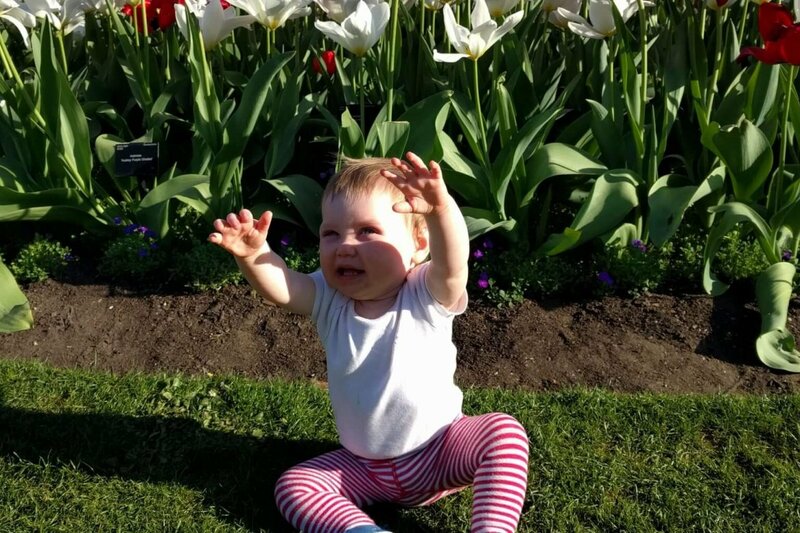 I love this photo of Isla sat in front of them, with her tights matching the flowers behind her (we had to take her romper off, as it was so warm) She is holding her hands up to her Daddy, asking him to pick her up. It’s like she’s saying ‘Why did you sit me down here? I want cuddles not to be sat here! Pick me up! !’ She really loves spending time with her Daddy these days, and it is lovely to hear them playing together. She proper squeals with delight, which is heart melting. Over the weekend we also finished laying some turf in the garden. Yes, Chris finally gave in. A little back story for this – last year before Isla was born Chris started digging up the “lawn” as it was pretty much just moss and weeds, so we thought we’d start again. It then took several months until we finished digging it all up. Then not all the seed took, so it was very patchy. We got some free turf a few weeks ago, so put that down on the bits where it hadn’t taken, and sowed some more grass seed on the other bits. But that didn’t take for some reason, so this weekend we gave in, dug all that up, and laid some more turf. Hopefully that will take OK, and Isla will have a nice lawn to eat play on during the Summer. Now, roll on a few weeks of lots of bank holidays, family, as well as a birthday party and Christening for a little girly!! Hope you all have a lovely Easter, and we’ll see you back here next week for another week of Living Arrows.